Electria is an innovative approach to using our 4-voice Recoil playback engine. We sampled a range of classic guitars matched to a set of classic amplifiers. Mosrite Ventures (with retro-fitted dual-humbuckers). In parallel the voices can be routed through our unique physical-modelling style exciter and resonator engines, where you can define exciter patterns and speed, attack, release and length as well as define a re-pitching sequence. Each voice channel has independent volume, pitch and sample-start offset controls, followed by vibrato and tremolo sections as well as 4 independent effect slots where you can assign up to 4 effects. Each effect slot offers you 20 different effects to choose from. Finally each channel has 4 send levels - which send to one of the 4 send effect slots. Each slot offers 6 different send effects. The entire instrument has overall volume, pan and limiter controls, as well as an intelligent randomiser to produce new and interesting sounds quickly and easily. 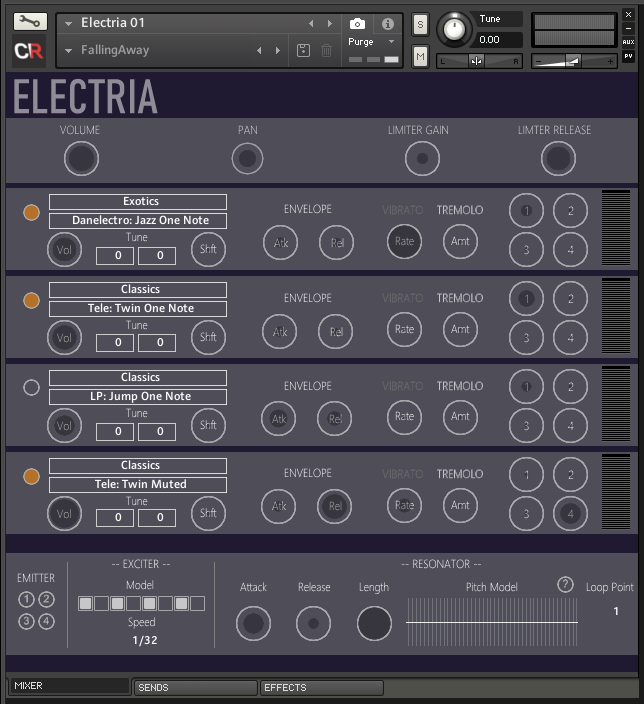 Electria comes with 40 Snapshots to get you started.